UN projections show global population reaching 11 billion—and the world economy growing by 500%—by the end of this century. Can the planet accommodate 3.7 billion more people when our current ecological footprint already exceeds Earth's biocapacity by 60%? This question will preoccupy humanity throughout this century, affecting everything we do, from designing building and cities to producing and using energy. Our mission is daunting: Somehow, we have to support 50% more people and raise billions out of poverty and reduce our ecological footprint to the sustainable level last found in 1976, when we were just 4 billion. Clearly, we have to change direction. Yet every facet of our social-economic-political order—indeed the totality of the dominant global culture--programs us to maintain the status quo: perpetual material growth. ELEVEN considers how we got into this predicament and maps a way forward. Runaway growth can be remedied: Buildings can operate on a fraction of the energy currently used; active and public transport can replace private vehicles; renewable power can replace fossil fuels; products can be made from fewer inputs. While humanity’s footprint must be reduced through such efficiencies, it cannot be sufficiently reduced through efficiencies alone. 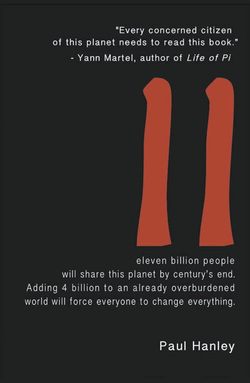 ELEVEN makes the case that a sustainable future will require an ethical revolution, one that will wholly transform humankind, reshaping its inner life and external conditions. This process will result in the emergence of a new culture, a new agriculture, and ultimately a new human race. Current models cannot generate the level of change that is demanded. ELEVEN introduces a framework for global transformation: Only a dynamic, grassroots capacity-building process, involving individuals, communities, and institutions, in neighbourhoods and villages everywhere—linked together on a global scale--can make this transformation succeed. Making the world work for 11 billion people will be humanity’s greatest challenge. That we will unite to meet this ultimate challenge is neither a utopian vision, nor even a matter of choice. It is the next, inescapable stage in human evolution. ELEVEN is available from online booksellers and select bookstores. See all links here. Paul Hanley has published extensively on the environment, agriculture, and other topics, including three previous books. He is a recipient of the Canadian Environment Award. "Every concerned citizen of this planet needs to read this book. That means you, you there. If climate change, environmental degradation, population pressures and all the other ills of this planet induce in you a sort of fatalistic hunkering down, or, worse, nihilistic glee, then Paul Hanley's book shows a way forward. Eleven offers a glimpse of a world of eleven billion people that will not only be livable for all of us, but, surprisingly, better than the one we live in now. “The book packs all the facts and parcels of knowledge that a solidly-argued work of non-fiction requires, but underpinning it is a spiritual argument that is even more convincing. At the heart of Eleven is an old-fashioned yet timeless and always radical emotional concept: love. A world packed with even more humans beings than there are now will be better, Hanley argues, because we will realize then what is of true worth: the connections we make with others. The fundamental unity of humankind, with all its emotional and existential consequences, is the guarantor of an authentically fulfilling life, rather than the clutter of objects with which we surround ourselves now or the mindless entertainment with which we fritter away our time. “Read this book, plunge into it. It will blast away the facile inertia to which so many of us succumb. The way forward is scary, yes, but also exciting. A greater, simpler, healthier world awaits us. Prepare for it, work at it. And start by reading Eleven." “Paul Hanley’s Eleven is the read for our times. Anyone still confused about the implications for global civilization of our gathering ecological and social crises—a number of politicians and policy-makers come to mind—should not be allowed out in public until s/he has read this book.